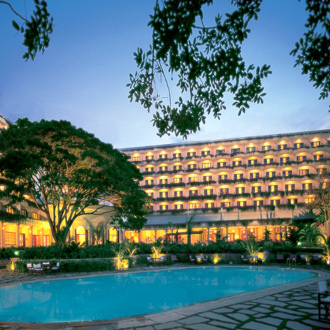 Located in the Garden City on MG Road is the Oberoi hotel in Bangalore which is connected to the major IT business park locations like Manyata & Whitefield. It is a classic confluence of modern & charming boutique hotel, adorned with 160 exquisitely styled rooms that overlook the pool & beautiful garden, this place also has conference rooms namely, Orchid, Hibiscus, & Hyacinth with satellite teleconferencing facilities. Some fine dining options include Le Jardin, Szechwan Court, Rim Naam & Polo Club.